Not much can disrupt the drug-induced illusion of happiness the residents of Wellington Wells possess. But one thing that is known to upset them quite quickly is people who refuse to take their Joy, known as “Downers.” Most of them live outside of the city, some content with enduring the nightmarish reality of things while others are forced to live there because they’re unable to take the medication. 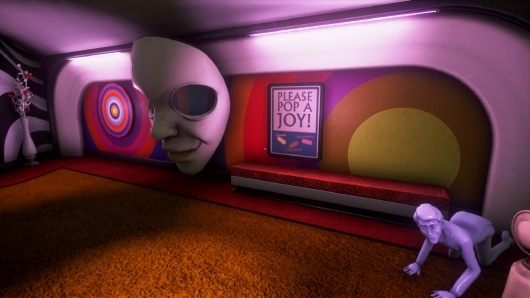 You the player will get to see what it’s like to live as a Downer in We Happy Few, and you’ll also get to see what it’s like for those who are fueled by Joy, either when it’s essential in progressing toward your goals or if you just happen to have access to some and want to give it a try. Everything changes, turns brighter and more vibrant. Even the music you’ve been hearing speeds up to its normal sound—though even the slowed down versions can still be catchy; one was stuck in my brain for days. It’s important to remember that too much Joy, however, can have nasty—or even deadly—consequences. So use responsibly! 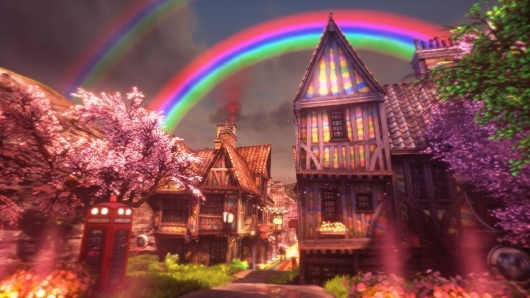 I’ve had an eye on We Happy Few for a long time now, but haven’t followed its progress so closely that I was aware of every change that’s been made to it over the years. I saw one trailer and just wanted to know when it would be released so I could check it out. An unfinished early access version of the game was released a while back, and I did download a demo for that at one point and almost played it a couple of times. But ultimately I decided it was best to be patient and wait for the final product to be released. A decision I’m glad I made. At one point the plan was to make it a pure survival game. You begin in a procedurally generated world. You collect as many resources as you can to help you survive as long as possible. And if along the way things go badly and you die, that’s it. Game over. Try again. Some people are into games like that, which I completely understand (and I believe there is a way to still play with permadeath though I haven’t tried it myself), but I was really hoping this would be more than that because it looked like such a unique world with so much potential to be great. 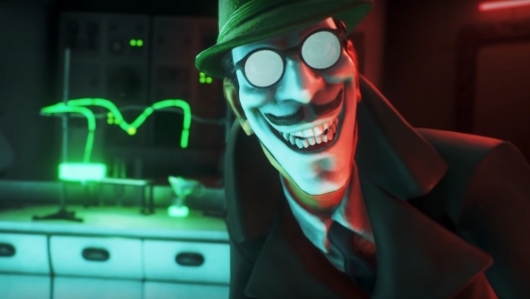 While We Happy Few isn’t quite the BioShock many have compared it to, I was pleasantly surprised to discover there is much more to the final game than just survival. It combines survival elements with RPG and stealth elements. You’ll scrounge up loads of items to use in crafting various useful weapons, gadgets, clothing, and more, and items to keep you healthy, well fed, and hydrated. You’ll explore the world, finding various tasks to complete, interesting things to investigate, and safe shelters to get some rest in along the way. You’ll do your best to stay out of sight as you navigate a dangerous area that holds something you need. 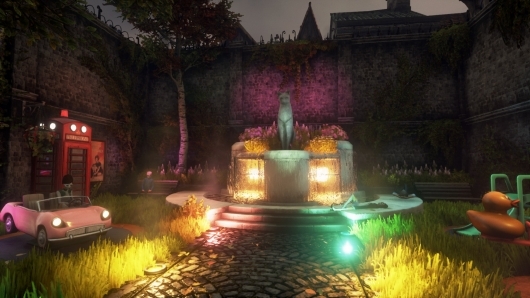 The world of Wellington Wells that Compulsion has created in We Happy Few is worthy of much praise. It can be dark and massively depressing at times. But once you reach Hamlyn Village—the city of Joy where people simply pop a pill into their mouth from time to time and carry on with their happy lives, blissfully ignorant of the real world—it’s something not quite like anything I’ve ever seen in video games before. These areas look like they were designed and built by Willy Wonka himself while on LSD. Lots and lots of LSD. The most surprising thing for me was the story campaign. Again I hoped it would be more than just the basic survival game it was once described as, but I still didn’t have very high expectations when it came to the campaign. But in addition to all of the stuff you’ll do mentioned above, there’s also a solid story to take in here. You begin We Happy Few as Arthur Hastings, a normal guy who doesn’t usually make much of an impression. He’s voiced by Alex Wyndham (HBO’s Rome). One day Arthur decides to stop taking Joy, and finds himself thrown out to live among the other Downers. This leads to him to begin remembering the things he was trying to forget, and on a quest to try to make things right. But Arthur is just one part. The story actually plays out through the eyes of three different characters, which only added to my surprise. After Arthur’s story, you’ll also play as Sally Boyle and Ollie Starkey. Sally, who is voiced by Charlotte Hope (Game of Thrones), is not only a great chemist, but the witty and stylish “It Girl” of Wellington Wells. But she, like most, has her secrets, and her story follows her attempts to juggle her various responsibilities while keeping those secrets to herself. As for Ollie, voiced by Allan James Cooke (Assassin’s Creed: Syndicate), he’s a Scottish soldier who might be a little bit crazy these days. Just ask his friend Margaret, who’s difficult to find. She’s imaginary, you see. Ollie served under the former army general Robert Byng once upon a time, and when he learns a terrible secret regarding something he should have known about, it sets him off on his journey. He believes he could be the only one left who can reveal the truth about Wellington Wells, and he may have lost just enough of his mind to succeed in bringing it all to light. The three characters’ stories are also intertwined, so you’ll find traces of the other two as you play and even bump into them along the way. An encounter with Ollie that Arthur has, for example, is where Ollie’s story eventually begins. And as you make your way through the game as these three characters, you’ll also slowly piece together the buried secrets of Wellington Wells and why things are the way they are. The characters themselves are great, but it’s the voice acting that really drove things home for me. There’s the usual dialogue during cut scenes and such, which is expected, but We Happy Few also features the characters vocally responding to things they encounter in the world, things they discover, things they remember. Sometimes, they’ll share a random thought as you’re heading toward your next objective or out collecting berries for a healing balm. This adds so much to both the characters and the world for me, and I appreciate Compulsion taking the time to include those little details. Apart from the main three characters, I also have to give a shout out to the face of Wellington Wells, Uncle Jack, who’s played by Julian Casey (Arrival). 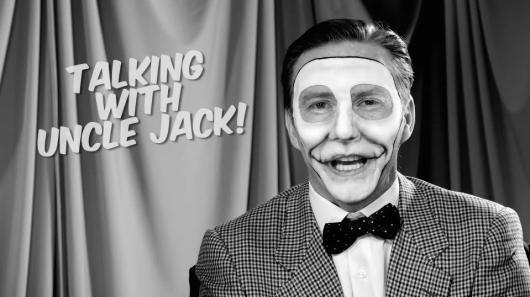 Unlike most of the performances in the game Uncle Jack is live-action, appearing on television screens everywhere and sharing his messages to help keep spirits high. 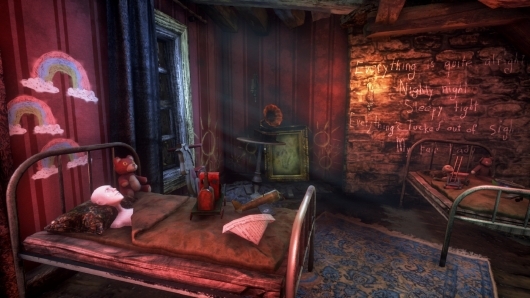 Uncle Jack is quite charming and adds great atmosphere to the game, while also being super creepy at the same time. He makes you a little uncomfortable, but you still have to sit and watch his program. Because come on, it’s Uncle Jack! I actually found myself wishing they used some clips of him during the game’s load screens, which can be lengthy at times. While there is a lot about We Happy Few I love, there’s also a couple of not-so-good things about it some might be interested in knowing before they decide to play or not. I played on Xbox One, so I can’t say for sure if these things also happen on other platforms. The biggest problem happens while you’re moving across the map quickly. When sprinting to escape enemies or even just walking at normal speed continuously for a bit, the game will sometimes stop dead and jump to a loading screen. It’s extremely frustrating when it happens. Like being punched awake from a dream. I believe The Elder Scrolls IV: Oblivion did this when I played it on Xbox 360, but that was over a decade ago. I can deal with a big open-world game noticeably loading around me while I move, but stopping dead to load breaks the immersion instantly. It’s not a game-killer for me or anything, and not nearly long enough to warrant the load screen Uncle Jack segment mentioned above. But it’s definitely a minor annoyance I wish wasn’t part of the game. I did think there was a game-killer issue at one point, but it turned out I was just confused. Still, it’s worth mentioning in case anyone is in the same mindset. I was always under the impression that when you entered an area where everyone is on Joy, if you weren’t also on Joy they would immediately notice and become hostile. So when I arrived in the first area like this, I took my Joy and tried to blend in. I quickly found out that Joy does not last long at all before you crash, and I felt like I was constantly jumping into a re-purposed phone booth to get another pill so no one would attack me. Eventually I got stuck too far from more Joy and dangerously close to reaching max memory loss, which basically just leads to a crash to end all crashes if you max it out. As soon as my Joy ran out, everyone around me turned on me. I had to make a run for it to get to safety, and I had no clue how I was possibly going to get around the village to each of my objectives without running out of Joy or overdosing on it—both of which lead to instant hostility. At one point I slipped into a back alley knowing I was dangerously close to reaching max memory loss. I took some more Joy while hiding there so I could weather the storm and figure things out from there. Once I recovered from this, I made an attempt to sneak back to my shelter despite it being daytime with people all around. It didn’t take long for me to get trapped. But no one noticed that I wasn’t on Joy. I didn’t know if it was a glitch or what, but I was massively relieved. It turns out you don’t actually need to be on Joy all the time, and I felt pretty silly when I realized this. There’s certain areas you can only access if you’re on it, but for the most part you can go about your business unbothered without taking it. It’s only when you’re on Joy and it runs out, causing withdrawals, that you stick out to the other residents. There are tips in We Happy Few that I believe point this out, but I somehow missed the memo. Ah well, it made for a few interesting moments. Another problem I have is with the game’s save system. You can save anywhere you want, which is a big plus, but you won’t be right where you saved when you load. You’ll either be at the nearest hatch shelter, or somewhere near where you saved. This can be both problematic and helpful, depending on your situation. If you’re stuck out in public and your Joy is about to run out, for example, saving and then loading that save could get you to a safe spot. But the real problem lies in actually loading a save file. There’s no way to do this from the pause menu that I could find. Which means if you’re screwed and want to load a save file, you have to pause, exit to the main menu, choose the save to load, and then wait while the game loads back up again. This is where I really wished there was something entertaining from Uncle Jack to enjoy while waiting. But overall I really enjoyed We Happy Few. It has a unique acid trip of a world to explore, plenty to do to keep me entertained for hours, great characters brought to life by exceptional performances, and a solid story to experience. No Joy necessary.